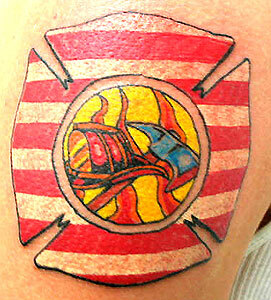 This tattoo was sent into us by tattoo artist Jeff Lewis who is also a firefighter. Description: We worked on this tattoo for about two weeks and finally got it just like he wanted. I took get pride in doing this becuase I was a Firefighter/Paramedic before I became a tattoo artist.